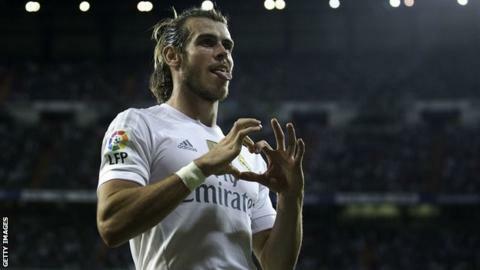 Wales manager Chris Coleman says Sunday's Madrid derby could be just the game Gareth Bale needs to help prepare for their Euro 2016 qualifiers. Bale, 26, hurt his calf on 15 September but is back in Real's squad to face Atletico at the Vicente Calderon. Wales face Bosnia-Herzegovina on 10 October and host Andorra three days later needing one point to qualify. "If he [Bale] does start or comes on maybe that's a good game for him," Coleman said. "That derby game is a tough one. I spoke to Baley about it and he said it was incredible... it'll be frantic. "I'll be watching it. Bale is a machine. He's an unbelievable athlete and I'm quite sure whatever they have to throw at him he'll be able to handle it. "I'm not worried about the physical hits, just hope that he's fully recovered from his injury." Wales are top of Group B and remain unbeaten in their qualifying group, with two games left to play, against Bosnia away in Zenica and then Andorra at home at Cardiff City Stadium. With just one more point needed to qualify for their first major finals since 1958, Coleman knows a piece of Welsh football history is there to be claimed. "You can't help but think of the possibilities and you can't help just having a little five minutes just dreaming about may be. We're all human," he added. "But I quickly come back down to earth, so you've always got to keep your eye on the prize." "Whatever we have been doing, it's been working for us and that must never change. "I know there's two games in the camp but we look at it as one. We prepare for Bosnia and it will be all or nothing on that game, it has to be. "If the result is a good one for us it will be amazing to come here in Cardiff. That's the incentive. It's that feeling of walking onto the pitch in a full-house in Cardiff when our supporters are in that mood. "I've never witnessed anything like it. I've never ever seen an atmosphere or felt it like we've had in Cardiff and that's the incentive for us."